What You Did Not Learn about the 10th Amendment! The foundation of the 10th amendment dates back to the very first immigrants into our Country. The first to seek refuge in the new world were religious dissidents seeking freedom to worship as they saw fit. In England, the law demanded the citizens to be members of the Church of England. No other religion was tolerated, which drove Puritans along with other Christian faiths and those who practiced the Jewish faith. The first of the Northern Colonies to be settled was the Massachusetts Bay Colony, while in the South Virginia. As more immigrated to the new world, those colonizing the South based their economies on agriculture that required were labor intensive; while those in the North due to the shorter growing season, based their economy on commerce that would eventually lead to the industrial side. Of the original 13 Colonies, three separate types had been created by King George; the first type being crown colonies that were entirely ruled by England. The Second and most abundant were the proprietor colonies, where leaders were chosen among the British royalty who had been sent by the King, by those who owned and operated various businesses. Finally, were simply known as Charter Colonies. These were the ones who had established their own territories and then submitted a charter consisting of territorial boundaries and the type of government to be instituted. Since England was involved with territorial disputes between England and Spain. For the most part the Colonies were self-governing, with exception to the crown colonies. Since each colony had its own government that was self-ruled.The only thing the colonies had in common was commerce; otherwise they considered themselves sovereign nations. Once England had come up with compromises with Spain and France, they tried to take complete control over the colonies. England had invested a great deal of money, providing for the needs of the colonies, during the early days and has expected to simply walk in and take control. By this time each of the colonies had already set up their form of government and resisted British control, seeing more as an intrusion than anything else. As the British placed more pressure on the colonies to comply with British rule, the more the colonies refused to comply. By this time uprising began to occur with those loyal to the crown looked at those rebelling to be more of a problem than a solution. Over the next fifty years the Patriot movement had established themselves and was in constant conflicts with the British. By the time of the stamp act and Boston Massacre, the roots to the revolution were already in place. No longer were the Patriots, only farmers but prominent people in society agreed with what they stood for. The colonies knew that alone, none could take on the British alone, so they began meeting in local taverns then communicate among themselves through commerce or simply passing the word, until all colonies were informed. At this point uprisings and battles were becoming more of the norm than anything else. Half of the citizens remained loyal to the crown, while the other half were after severing all ties with England. This led to the creation of the Colonial Government. By 1775 the Colonies agreed the only way to win their independence, was to declare a collective Declaration for Independence. By July 4th 1776 fifty-four representatives from all thirteen colonies had signed the declaration which was sent to King George III. The Signing of the Declaration of Independence was the official creation of our Union. At this point the Colonies had no intention of creating a new country. The Colonies only goal was the return to being self-governing, with as small of a centralized Government as possible. On July 12, 1776 The Second Continental Congress was formed who would be the formal Government. Back in 1776 the term “Congress” was different than today, during this period in time congress meant representative, Thus the Second Continental Congress was viewed as a group of representatives from the thirteen Colonies. The British finally granted the establishment of the United States of America. The Second Continental Congress knew they needed a formal Constitution. A Panel was created by the congress to create The Articles of Confederation and perpetual Union. As with most documents created by autonomist states, there was much debate on how to work together without creating a centralized Government that could seize control over all of the States. By the end of 1777 the Articles of Confederation and perpetual Union were complete and sent to the thirteen colonies for ratification. Even before the Articles of Confederation was ratified it gave The Continental Congress a means of directing the Revolutionary War. Article I establish the name of the Union to be called the United States of America.While Article II asserted that all States would maintain sovereignty and self-governing power. The remaining three articles ascertained an agreement of cooperation and friendship between the states with all legal citizens having the ability to move freely throughout the country; while the Federal Government would have very limited powers over the union. Not long after creating the Articles of Confederation and perpetual Union was simply inadequate. Once again the Continental Congress created a panel of representatives to create a more suitable Constitution. As the representatives headed for the Constitutional Convention in 1778, none of the Representatives had intentions of creating a new Constitution, believing they would simply add what was needed to the Articles of Confederation where they could address the deficiencies of the existing Articles. After a month of deliberations and arguments it became apparent that the Articles of Confederation could never meet the requirements needed to create a functional Union. This stalemate continued as the delegates fought over how to create a viable Constitution. This led the eldest statesman Benjamin Franklin to request that he could address the delegates of the convention. Franklin was in his mid-eighties at the time as he addressed the delegates. His now famous address called for Prayer before every session of congress to be led by different members of the clergy. This address proved to be exactly what was needed. The biggest concern in creating this new constitution was giving the Federal Government too much power. They had just fought a revolution to obtain their own sovereignty. So they had no desire to create a centralized Government who had too much power. All of the delegates agreed that a Federal Government was required to meet the needs of the States, beyond that the new country wanted to maintain state sovereignty. During the ratification process, several states had refused to ratify the constitution feared the Federal Government held enough power to take control over the states and without amendments to address their concerns, they refused to ratify the Constitution. After the Bill of Rights was created with the freedom to establish more amendments when needed, Ratification of the Constitution went into effect in 1789. Of the Bill of Rights, Thomas Jefferson being an anti-federalist believed the tenth amendment to be the foundation to the constitution. Prior to the creation of the Bill of rights, concerns over state sovereignty, even though Federalist #45 submitted by James Madison on January 26, 1788, where James Madison assured that a state’s sovereignty would not be violated. In addition the articles of confederation would act as a failsafe should State sovereignty ever be challenged. 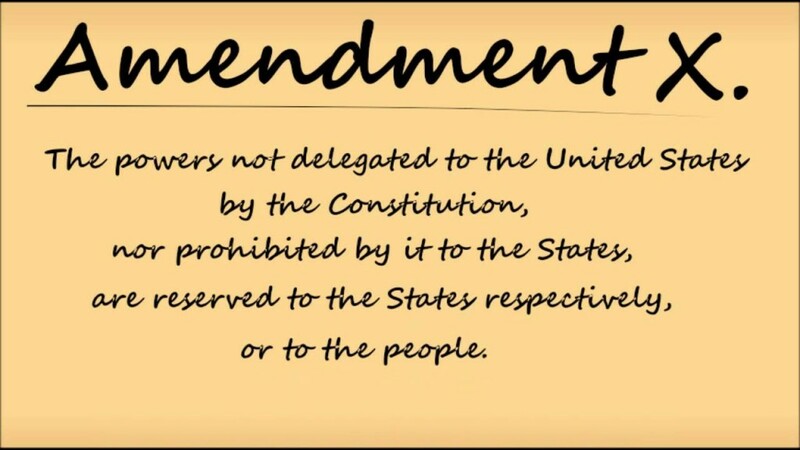 Unfortunately in spite of all the attempts made by our forefathers to protect State sovereignty, the wording in the tenth amendment left too many areas that could be exploited by the Federal Government. At the time of the writing of the Bill of rights power was given to congress through Article VI Section II known as the supremacy clause. That stated the laws contained in the Constitution was the supreme Law of the land and the law shall rule even if it conflicts with State Laws. The first attack on our States sovereignty came with the Alien and Sedition Act passed by congress in 1789. Both Thomas Jefferson and James Madison claimed Government over-reach. Though debatable, this would prove to be the first of many attacks by the Federal Government and our 10th amendment. Of the three branches of Government, the Supreme Court has led the way in taking away our state’s sovereignty, beginning with McCulloch vs. Maryland (1819). This case though in appearance does not seem unreasonable. This ruling would enable the Federal government to pass laws not expressly provided under the Constitution, provided those laws are in useful furtherance of the express powers of Congress under the Constitution. This single ruling paved the way for the Federal Government to essentially obtain supreme power over the entire government, including the constitution and Bill of Rights. Though our forefathers did everything they could to ensure the Sovereignty of our States. It was the way the 10th amendment was worded that gave the Supreme Court a means to exploit the wording that would give the Federal Government supreme power over the Constitution of the United States of America. Supreme Court justice John Marshal is therefore to blame for our states losing the power to self-govern. Today not only is our 10th amendment rights in jeopardy due to this single ruling, the entire constitution along with the Bill of Rights and every subsequent amendment. Though the assured Sovereignty of the states can be argued by referring to the Articles of Confederation and Federalist #45, the Court has elected to ignore the federalist papers and articles of confederation. Until Congress is willing to address McCulloch vs. Maryland and rules that this case is in violation of the Constitution, the Federal Government will continue to eliminate our rights while dismantling The Constitution of the United States of America. Thank you for taking the time to read this. Again thank you for your time and may God Bless all of you, especially those who believe in our Constitution and Bill of Rights. Incompetence In Government is EverywhereWhy Does it Matter How We "Name" the Enemy?